While iPhoto has included the ability to export a group of photos as a Web page for some time, I’ve never been that impressed with results (at least up through iPhoto 6 ). Pages generated by the export feature in older versions of iPhoto have left me with bland pages and little control over the HTML. 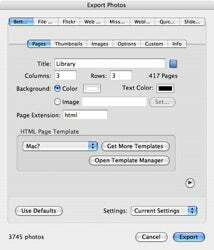 Sure, iLife ’06 promises more control over Web output, chiefly through the addition of the new iWeb component. But what if you don’t plan on upgrading to the new version? You’ll need to turn to a third-party program—my exporter of choice has been BetterHTMLExport ( ). The separate Template Manager application gives users a variety of nice looking wrappers for their finished Web pages. Many of the themes are styled after popular Apple styles like brushed metal, aqua and others. One big downside, despite the large number of themes to choose from: they haven’t been updated for almost a year. Still, BetterHTMLExport is a superior option over the functionality in older versions of iPhoto. And the included templates result in far better looking Web pages.